Right now, Munson Medical Center recommends all women start getting an annual mammogram at age 40 until at least the age of 80. Many organizations agree that’s the way to save the most lives. While no woman will say it’s fun, the technology is improving, making detection easier for doctors in many cases. 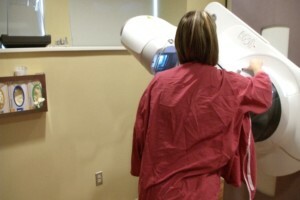 Mammography is changing for the better, but women coming for their yearly checkup probably won’t realize it. “From a patient perspective, it’s going to be exactly the same. Initially, we’re going to take a couple of extra pictures but, again, from the patient perspective, it happens very quickly in the same set so they won’t even notice,” said Dr. Leah Carlson, M.D., a radiologist specializing in breast imaging. It’s the radiology specialists at Munson Medical Center like Leah who are seeing the big changes. “Instead of taking a single picture we take multiple low-radiation dose slices, multiple pictures that we can work back together into an image set. It’s almost like going through a 3-dimensional manner,” explained Dr. Carlson. In the end, that makes a difference for the patients. “We can actually increase the detection of invasive cancers by about 30 percent. We’re also decreasing the number of women being called back for things that are not cancer, that are not anything we need to worry about by about 40 percent,” said Dr. Carlson. Women with a family history of breast cancer and those with dense breast tissue will see the biggest benefit with the new technology. For women with the most invasive cancers, it will hopefully make life with cancer a little easier. “Being able to detect more of those at a smaller size with the current treatment options available will allow women to have smaller surgeries, less radiation therapy, less chemotherapy and still have the same long-term outcomes, and they’ll still do very well but will hopefully have less aggressive treatment if we catch these cancers early,” explained Dr. Carlson. Right now there is only one new machine at Munson Medical Center, but that will change.